Regular readers of this website knows that I had no idea who Christine Love until someone suggested one of her projects to me. Since then, I have defied every bit of Earthly logic to become something of a fan. 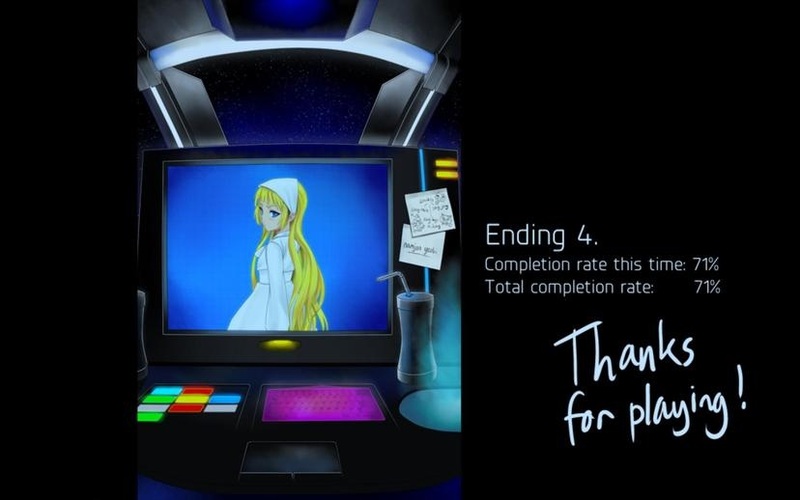 And after playing the terrific Analogue: A Hate Story (Review Here) I knew I had to interview her. So without further ado, please enjoy this conversation with one of the most intriguing minds in the EVN world! VNs Now: I hope you don’t mind me skipping the usual generic questions, since I really want to ask you a few things about your latest work. I can’t imagine you woke up one day and said, “Let me find an historic Korean dynasty that treated women like dogs.” How did Analogue’s story come about? Christine Love: From all I’ve studied of Korean history, the Joseon dynasty’s always fascinated me the most for a number of reasons, not all of them negative. But I’d be lying if I said the most striking thing wasn’t the way its treatment of women degraded over time, especially in comparison to the end of the previous dynasty. Like, I couldn’t imagine living in a time like that; from a modern perspective, it’s so horribly dehumanizing it seems like it’d be a fate worse than death. But obviously women did, somehow, survive, and when trying to understand how misogyny works, “couldn’t imagine” is not a satisfactory answer. The plot is moved mostly by the Pale Bride, who is the modern girl who can’t understand what’s going on—i.e., my perspective—but the crux of it, really, was trying to get into the heads of everyone else, the men and women who have internalized all these awful misogynist ideals and take them completely for granted as the way things are. So the story really just formed itself around that question: what would it be like to be a woman in that society? History didn’t care about the answer, but I do. The rest—the modern-thinking woman who can’t possibly survive, the women who are forced to navigate family politics, the men who are complicit in this whole system but can’t just be dismissed as bad people—all came naturally in that attempt to answer it. VNs Now: *Hyun-ae and *Mute were both very complex and beautifully written. What was their development like and did they change over the course of you producing Analogue? CL: There were a few details missing, but for the most part, I had a pretty good idea of how *Hyun-ae would turn out from the start. It was pretty obvious that the Pale Bride was going to be as horrified by that society as anyone else would, and that it would break her. She never really changed much. *Mute, on the other hand, I didn’t really know how she’d end up turning out. I knew that she had to be opposed to *Hyun-ae, that she was the real security AI on the Mugunghwa, and that she’d be conventionally attractive for her era; past that, I had nothing. As her cheerful misogyny began to emerge, I started to hate her, especially with every line I wrote that had a deferential version for a man playing, but a demeaning version for a woman playing. Then she started to grow on me; it was never really her fault she was like that, it was just her way of surviving, I realized. There were no huge surprises from either, no giant twists, but I definitely never anticipated feeling so much sympathy for *Mute. VNs Now: As disturbing as the world of Analogue is, by the end of the VN I found myself understanding the crew of the ship. I don’t think it was compassion, but the Ryus and Smiths just felt very normal: very average instead of what you’d expect from people driven insane by space. Was this intentional? CL: I don’t really think they were driven mad by space; they just didn’t know anything different. Actually, in a way, I think even the Ryu, Smith, and Kim patriarchs are defined by those constraints. They’re ignorant of so many things, trapped in the confines of the ship, just as they keep their women ignorant and trapped in the confines of their inner chambers. It doesn’t drive a person mad, it turns out–as in the real Joseon dynasty, it’s incredibly stable. It reduces lives to miserable, pitiful existences that miss out on so many important things, facing challenges that nobody ever should; yet somehow, people still manage to survive. So I think, really, the Smith and Ryu families, and even most of the Kims, are very normal people. With the exception of the Pale Bride’s adoptive parents, none of them are actually bad people, not even the men. They have their own petty family problems, their own personal failings, but it’s not as if they’re acting out of malice. For them, that’s just the way things are, they’re taught from an early age. They may be complicit in oppression, but it’s certainly not a conscious decision; at heart, they’re mostly good people. And if you grew up in that kind of society, you’d probably be the same. VNs Now: Your last few projects, while fun, have also included some very interesting global issues. Don’t Take it Personally took on the idea of privacy and Analoguedealt with the treatment of women that’s still a big problem in the world. Are these issues important to you or is it just a matter of building the story? CL: Well, of course they’re important! I think DTIPB’s approach ended up being a bit clumsy, and I’ve tried to avoid anything that could even look like moralizing with Analogue, because it’s certainly not my intent. Frankly, I don’t think Analogue ever says anything particularly controversial. I mean, I don’t think it’s hard to see relevance in Analogue. “Progress” can easily come undone, for one, but more importantly, that’s what misogyny looks like when it’s taken to its natural conclusion. Defining women by their ability to reproduce, reducing women to their appearances, silencing women’s voices: these are all things that are definitely relevant today! The people who do that in our society are more subtle, of course, because it’s hard to notice that when you’re surrounded by it. I don’t have any sort of statement to make. It’d be pretty meaningless and worthless to say something like “oppressing women is bad.” I just wanted to explore the way misogyny manifests; to show what that’s like in a way that’s more visibly obvious, and to understand how that effects the way people think. Obviously these things are important to me. But if you want a moral statement, well, I leave that entirely up to the reader. VNs Now: I know how people reacted when they pursued an obviously immoral relationship in Don’t Take it Personally and I’m sure not everyone could’ve been happy with Analogue. Do you ever wonder if you’ve pushed the line too far? CL: If the reader isn’t shocked, then I don’t think I’m doing my job right. Of course, I’d never be sensational just for the sake of it. I’d like to think that I’m above cheap tricks. But when people are shocked, they’re then forced to evaluate why. That’s what I want: to make people think. It’s hard to inspire that if you just play things safe. I mean, I won’t lie and say that I’m happy about the people who seem to think that including bad moral decisions in DTIPB means that I’m endorsing them. It’s a thoughtless response, an absurd one, and yeah, it kinda stings to see people lob that accusation. But if risking being misunderstood is the cost of actually trying to have an impact on the reader, then I’m willing to accept that. VNs Now: Now onto Metacritc. While I have my own criticisms of the site, in a search for English Visual Novels your works are pretty much the only EVNs that have been critically reviewed on the entire site. What are your thoughts on that? CL: Well, Metacritic itself is kind of a joke. Reducing everything to numbers isn’t something that’s ever really made sense to me in a review. Why would you even pretend that reviews of artistic works can be reduced to some sort of objective measure? Isn’t that kinda crazy? I don’t get it. But, I mean, the reason why I’m the only ones on Metacritic is that I tend to get a lot more press in general, not just from numerical review scores. I’d really like to see that change, for sure! It shouldn’t just be me, and there’s a lot of things coming out in the future that look like they really deserve that much attention too. I hope they get it! VNs Now: Looking back over the visual novel projects so far, other than the issues, is their anything you like people to take away from your work? CL: I don’t know if I can say anything without it sounding trite! But my hope is that I can encourage people to look at things from other peoples’ perspectives; my works are really always about trying to see things from different angles. It’s the only way you can understand what’s really at the heart of things, after all. Simple, trite, and obvious, probably. But that’s what’s important to me. VNs Now: Your twitter page has been filled with not-to-subtle hints on your next project: something about ‘Comics vs. Games’? Is there anything you can tell us about that? CL: Well, it’s not so secretive! Comics vs. Games was a jam in Toronto that teamed up established game developers with comic artists, to make a game together. 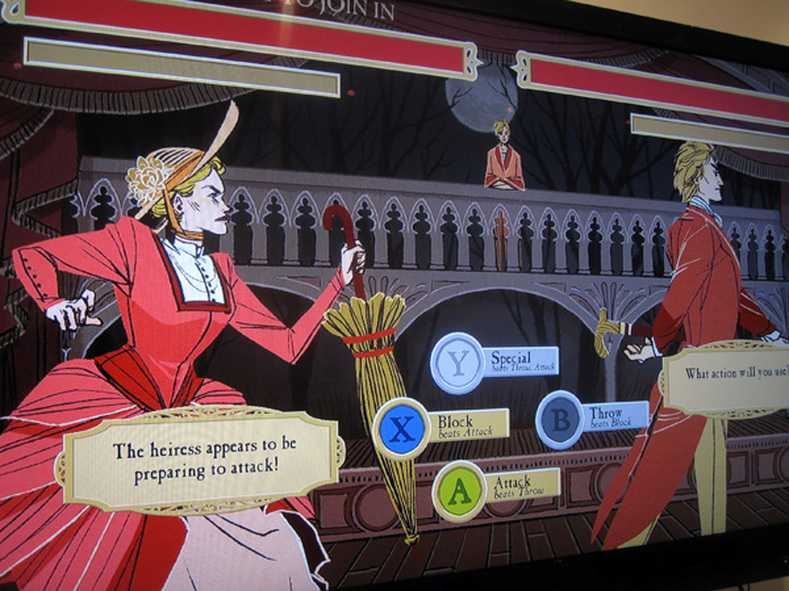 I personally worked with the super-talented Kyla Vanderklugt to make a Victorian-era turn-based fighting game called The Mysterious Aphroditus. They were all displayed at a local art gallery and the Toronto Comics Art Festival last month! It’s not available online yet, since it was designed for a very specific gallery exhibition, and, uh, has a lot of stability issues. I’ll probably release a port of it for a more general audience sometime later this year. VNs Now: Christine, thank you very much for sitting down with me and we are looking forward to what you do next! CL: Thank you! It was good talking to you. Follow Christine Love on her blog here!